Let’s be honest, the honeymoon is the best part of getting married. After all of the stress from planning and the chaos of the big day, the honeymoon is when the love sets in and the celebra-tion with you and your other half truly begins – which is really what it’s all about. And if you plan your wedding with a bit of cleverness and adventure in mind, your honeymoon can start right away! Yep, we are talking about a destination wedding. Destination weddings are perfect for any couple who wants to get away, maybe have a smaller wedding, or anyone who may want a beautiful backdrop for their ceremony, but doesn’t have one in their backyard per say. Whether your taste for adventure lye at the beach or in the mountains, you can always count on a destination wedding to be fun, beautiful, and easy access to day one of your honeymoon! Now that we all agree that destination weddings are the way to go, how do wedding invitations and a honeymooner’s guide fit in? 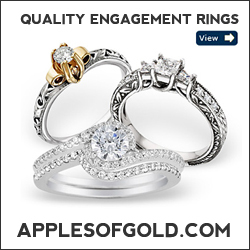 Well, that all depends on the couple’s tastes, their individual needs, and the location. So, let’s break it down. First, let’s talk destinations and then stationery to match. The beach is a time-honored choice when it comes to destination weddings. The beach is ro-mantic and festive and always beautiful! There is so much variety when it comes to beach des-tinations. You can choose a quiet lake. Head to the west coast where for palm trees, dark blue seas, and black mountains. The east coast is a classic choice. And of course you can head to Hawaii or any other island for a more tropical feel. No matter the specific style of sand and sun you go for, a beach wedding is perfect for a couple who wants a laid back, vacation vibes wedding day. Let’s face it, getting married at the beach is basically like getting married on your honeymoon and what’s better than that?! An elegant choice is heading to the mountains. Especially for an elopement ceremony. Choosing to go to the mountains for your ceremony will result in beautiful photos and a serene atmos-phere. You’ll be away from the hustle and bustle of city life which will help calm any nerves you may have had otherwise and offer a peaceful walk down the isle so you can take it all in! Just like the beach, mountainous destinations vary widely! The desert offers red rock and black lava while somewhere like Colorado has snow capped mountains and pine covered hills. A mountain location will give your day a romantic feel. All you need is to rent a cabin and tuck yourselves away after the wedding to kick off your honeymoon with a blanket by the fire. The most rustic choice for a destination wedding and honeymoon is heading into the woods. This is definitely a choice for a more outdoorsy or eclectic couple or maybe for a couple used to living in a big city who want a change of scenery and an adventurous honeymoon. The woods offer a beautiful and natural setting so you won’t need a lot of decorations. A cute idea is the set up some tee-pees for your guests or have everyone bring a cozy blanket to sit on. When your big day is over stick around and have a week in the woods sitting by the fire, fishing, and taking in the earth! This may sound a bit unconventional, but it’s perfect for those who ap-preciate what nature has to offer. The ultimate destination wedding – heading overseas. Depending on where you live in the word and where you are headed, overseas can mean a lot. From Paris to Greece or the Italian coun-tryside. Maybe Ireland, Australia, or New Zealand… the options are pretty much endless and each place is more romantic than the last so there is no going wrong! Going overseas may call for an elopement which means your honeymoon will start the second you land – even if you aren’t technically husband and wife quiet yet! It really doesn’t get more romantic than that! When it comes to wedding invitations and stationery for a standard wedding couples will usually follow the standard timeline and etiquette. Save the dates followed by an invitation suite and so on. But when you are planning a destination wedding there are no rules and anything goes! So, let’s talk about what options all brides have and what suggestions might suit your destination wedding best. For a traditional bride, a larger wedding, or a year-long engagement all of the above might be used and necessary, but for a destination wedding or elopement that may not be the case. In-stead, if it doesn’t apply let it fly! Spend your efforts on the pieces that count most. So what’s most important? Save the dates, invitations, rsvp cards, and announcements. Save the dates are vital for a destination wedding because you want to give your guests the longest heads up possible. Destination wedding cost money, take time to plan for, and require a few free days. So, save the dates are a great way to get your wedding on the books in a timely matter. A cute idea for a destination wedding is a save the date post card. Post cards are often sent home from destinations so incorporating that vibe into your stationery is a cute touch! Next, your wedding invitations. Wedding invitations are important because that’s where all the important info for your guests will be. For destination weddings, a full wedding suite may not be the best option. A storybook wedding invitation is a much more practical invite. A storybook wedding invitation is a six-sided trifold booklet. This way you can print all of the information for your guests in one place. They can pack it with them in their luggage and reference just a single piece of stationery as opposed to enclosure cards. 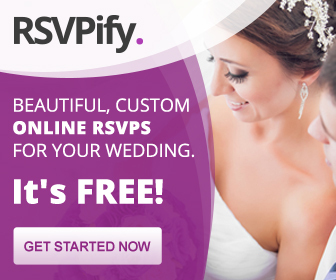 With that said, rsvp cards are a must for any occasion. So, be sure not to skip the rsvp cards. Lastly, wedding announcements. Since a destination wedding usually has a short guest list wedding announcements are a great thing to order and send out to loved ones who didn’t make it. And there you have it! The honeymooner’s guide to destination wedding invitations. Choose your destination based on where you want to honeymoon and plan your wedding around that. Once you have your guest list send out your save the dates. Your guests will appreciate the heads up. Make sure to get an invitation that is practical and useful for your guests. There will be travel information, hotel information, and so much more. Announcements and thank you cards are a must for all weddings especially a destination wedding. You can even write your thank you notes on your honeymoon! Head over to Basic Invite to get all of your destination wedding stationery. 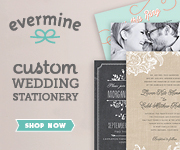 They are an online stationery company with everything you need. With over 180 custom colors, 100 fonts, and the option to personalize every aspect of your invites they are the custom card company. Currently Basic Invite is offering 15% off everything site wide. Use code 15FF51 and customize yours today!